Earlier this week, writing for ZDNet, Scott Raymond proclaims: "Chromebooks are dead, they just don't know it yet". He makes a good argument, which I partly agree with regarding Android tablets. I'll get to that later. He also asks: "Why would I want to switch to a Chromebook when my MacBook Air runs OS X and Windows and is at least a pound lighter?" That's exactly what I did -- sold my MacBook Air and switched to Chromebook, which I used for the entire month of August; still today. Chromebook is an interesting invention, because of the concept: The browser is the operating system -- well, Chrome running on top of Linux. The browser is the user interface. There is no desktop, although file system and local storage are accessible. Acer and Samsung each make two models, both running Chrome OS, one with WiFi-only and the other with 3G, too. To be clear at the outset, Chromebook isn't for everyone, and probably not for most people. Chrome OS has some sharp edges that will bleed the user experience for many, if not most, users. While enjoying the overall computing experience and finding plenty of performance and utility, I couldn't do video editing, and photo editing (using Picnik) requires some sacrifices (such as shooting in JPG rather than RAW). Some Web-based services are either torturous to use or behave badly. For example, AIM is dreadfully taxing on overall system performance and the group messaging service we use here at Betanews reports me as idle when I switch browser tabs. These are minor annoyances I can live with that others wouldn't. Adobe Flash plugin frequently crashes -- and that's not surprising -- as does Google Talk, which is unexpected. Browser tabs crash too often, as in sometimes on my Chromebook compared to almost never when using Chrome browser on Mac OS X. So there's no confusion: I've been getting Chrome OS updates through the regular release channel rather than the beta, which is an option, so that's not the reason for any crashes. The OS locked up only once during the 35 days I have used Chromebook as primary PC and later the only one. Benefit: crash recovery. However, Chrome OS recovers faster than any operating system I've ever used. Whenever I've had to reboot, mainly because Flash screwed up something, Chromebook powered off, powered on and returned to the previous state in typically less than 20 seconds. I should emphasize: Returned to previous state, meaning all tabs restored where they were with the writing or other work exactly how it was before the reboot. This amazing recovery capability is one of Chromebook's most differentiating benefits compared to Mac OS X or Windows 7. But by no means is it the only one. I first used Chrome OS on Google's unbranded Cr-48 test laptop for 7 days in December. I had another 7-day go round in March, when my MacBook Air failed and Apple Store replaced the five-month old computer. I was so psyched by the quality of customer service, I bought an iPhone 4 that night and iPad 2 the next day, when it went on sale here in the United States. I sold all three Apple products in August, as part of a broader experiment -- to go all Google products and services. Next week, I'll start writing about that Google-only experience -- hopefully. I had expected to throughout much of last month, but typically slow news month August was anything but. I am using the Samsung Series 5 Chromebook with WiFi and 3G. Basic config: 12.1-inch LED display with 1280 x 800 resolution and 16:10 aspect ratio; 1.66GHz Intel Atom N570 processor; 2GB DDR3 memory (not expandable); 16GB solid-state storage; integrated NM10 graphics; ALC272 integrated audio; stereo speakers (which in my tests deliver surprisingly rich sound for the class of machine); internal microphone; 1-megapixel webcam; WiFi N; Verizon 3G (on higher-end model); headphone/Mic jack; two USB ports; 4-in-1 memory card reader (SD / SDHC / SDXC / MMC); and 6-cell battery (with stated life of 8.5 hours). This model lists for $499.99 but Amazon sells it for $50 less and the WiFi-only one for $399.99. The Acer model has similar specs but 11.6-inch glossy display; Amazon sells the WiFi model for $349.99 and the 3G cousin, which is backordered, for $429.99. Chromebook critics often cite the need for constant Internet connection as reason -- the only one needed -- for why the portable is FAIL. Many of these people have never used Chromebook. We live in the connected era, where most everyone needs a network or Internet connection all the time. Air travel is one of the major exceptions. But even there Chromebook provides adequate offline access to Gmail, Google Calendar and Google Docs, as well as some applications. Hey, you can play Angry Birds if offline, baby. My Chromebook has a Verizon 3G cellular modem and 100MB free data per month; it's a benefit guaranteed for two years. I have yet to activate the service, because I've always been able to find a WiFi connection. Not once during the last month did I lose one second of productivity because the Internet wasn't available. Chromebook critics also often compare the laptop to netbooks for price, configuration and battery life, arguing that at least netbooks run a real operating system. Oh yeah? So what's Linux then? I would take Chromebook over a netbook running Windows 7 Starter Edition any day. At my daughter's high school, students use netbooks for a required college preparatory class. Considering they also use Google Docs and Search -- and many of them Gmail -- and spend most of their computing time in a browser, Chromebook would be better fit. Google has a subscription program for schools -- $20 per Chromebook per student per month. Earlier this week, Google spotlighted three schools that signed up for the program. One institution got 110 Chromebooks. For that $2,200 per month, Google provides tech support and Chromebook replacement/upgrades. Benefit: frequent updates: Google frequently updates Chrome OS, which removes a major administration headache, whether for these schools, businesses or the average Jane or Joe. Chrome OS development is closely aligned with Chrome browser, which is on a fast-track of six-week cycles -- generally with three different browsers at some stage -- during the time. Google has released four browser upgrades this year so far. My colleague Larry Seltzer argues this is a pain for IT; I won't disagree. But when it comes to Chrome OS, frequent updates are a benefit. I'm not exactly sure the count, but Chrome OS updated at least five times during the last 35 days. Each time, something got better. It's refreshing to get new features and see performance improvements on a regular basis rather than waiting for major updates for Mac OS X and Windows. My Chromebook is better today than it was last week. I can't complain about that. I made Chromebook my primary PC on July 31. Because I was using Chrome on MacBook Air as my browser, moving was about as difficult as flipping a light switch. Benefit: easy setup. Chromebook boots up faster than any computer I've ever used, in about 13 seconds and 1.5 seconds from sleep. To set up Chromebook, I powered on, selected wireless network, entered Google account credentials and turned on browser sync. Within seconds of that last action, Chromebook synced tabs, web apps and other stuff from Google's cloud. That's it. My mom inherited the Cr-48, and setting it up was that easy. It's a truly amazing benefit. Because of Chrome sync, the experience follows me to other computers or should I switch Chomebooks. Benefit: guest users. Chrome OS supports multiple Google user accounts and there is a guest one, which is ideal for people who sometimes share their laptop. Say, kids, concerned Arnie or Abby will get your Facebook log in and ruin your reputation? Chromebook lets you log on without giving away your credentials left in cookies or password manager on your friends' accounts. During my first week with Chromebook, I used it about 90 percent of the time, falling back to my wife's MacBook Pro. It was easier to do some image capture and photo-editing tasks there, for example. I also needed my wife's computer to upload my library of about 11,800 songs to Google Music beta, which took the better part of 40 hours. Now I stream from my own library or from MOG. I spent $7.99 on music last month, a huge reduction from buying. That's the cost for streaming from MOG and downloading tunes to Samsung Nexus S for offline listening. 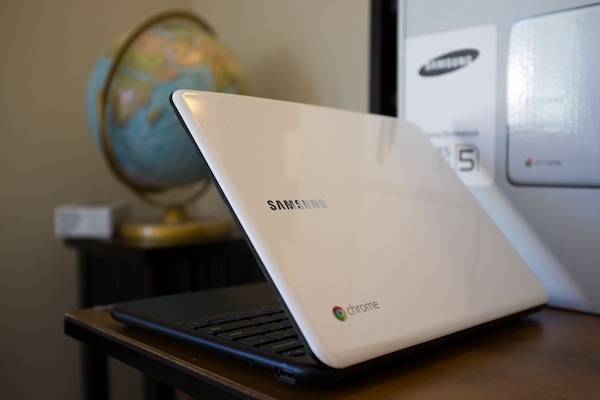 Following BetaNews' relaunch on August 20, I finally moved to 100-percent Chromebook. There is nothing that I typically would do on MacBook Air I can't on Chromebook. I'll look at this in-depth user experience perhaps in a follow-up post. Google has done a remarkably good job connecting Chrome OS to its other services. For example, if I receive an email with Word file in .docx format, clicking the attachment opens Google Docs in view mode, and I have the option to edit the document. Another example: In file manager, if I highlight a photo, there is open to "send to Picasa". But some of the rough edges cut arteries. I recently received some .rtf files that couldn't be opened for editing in Google Docs. WTH? What's more basic than rich text format? I had to open the files on my wife's MacBook Pro in Apple Pages. Another: ZIP files. Unless the Chrome OS update received two days ago changed something, there's clunky support for ZIP files. Say, Google, this is Platform 101 stuff. Benefit: battery life. One of Chromebook's best benefits is battery life. I typically unplug from power around 4 p.m. and take the laptop out into our apartment complex's courtyard, where there is a set of table and four chairs I bought from Costco. The set is there for public use, but I'm its biggest user. I typically work there for three or four hours before shutting the lid for the night. Chromebook remains unplugged overnight before I resume work, back in the courtyard, around 6:30 a.m., where I stay until the mid-day sun or dead battery drives me out, which typically is between 11 a.m. and Noon. You do the math. I typically have no less than 10 tabs open. From full charge, the laptop claims about 8 hours battery time. That's typically the least I get. By comparison, the MacBook Air used before Chromebook typically delivered 4 hours battery life, sometimes a bit more. So unplugging on a full charge at 6:30 a.m., the Apple laptop rarely made it to 11 a.m. and more often an hour earlier. By measure of productive time when mobile Chromebook is an exceptional performer. Chrome OS is major reason. Rather than running bloated apps on the desktop, lighter apps or connected services run in browser tabs. If not for Flash's negative impact, battery life might be considerably better even. 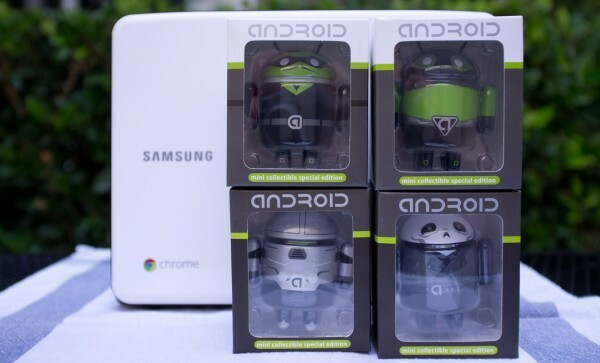 My big problem with Chrome OS is Android. Why have both? Android 3.x Honeycomb is visually more appealing than Chrome OS and there are many more useful apps. Do you really need one when you've got the other? I think not. Of the two, I would choose Android on a tablet over Chrome OS on a laptop, assuming all functionality was equal -- and it's not yet. The browser is the key. Scott Raymond writes: "Apparently the WebKit folks are working to consolidate the source code for WebKit and Chromium. The end result of this would be that the browser on Android tablets will eventually be replaced by a Chrome browser...if we had the Chrome browser on an Android tablet, why would we want a Chromebook? For the price of a Chromebook you could pick up an Android tablet with a keyboard that connects via dock or bluetooth. You would have the same functionality, plus the added capabilities of Android". I agree. The Android tablet gets my vote over Chromebook, much as I like it -- rough edges and all. I'm now debating what next? Should I continue using Chromebook through end of September (even longer), or switch to something else? While I've found using Chrome OS satisfying enough, I expect Microsoft to release some kind of Windows 8 beta around September 13, when the BUILD conference begins. Returning to MacBook Air is an option, which would let me run Mac OS X Lion, too. That's new enough to deserve more of my time, and perhaps a review. There are also plenty of enticing Windows laptops worth trying and reviewing. I'm taking suggestions for makes and models, if you've got one.